Solarflare Communications has reduced product development time, accelerated production testing and increased manufacturing yield by using the XJTAG system to develop and test its EtherFabric™ Network Interface Cards. The company’s EtherFabric EF1-21022T Network Interface Card is a low profile PCI network card containing 95% digital circuitry. The board comprises several ball grid array devices including a network controller, two transceiver modules, Content Addressable Memory, SRAM and Flash chips. These devices cannot be effectively tested using probe-based test approaches or X-ray systems. To solve the implicit test access challenges, and to enhance the overall test strategy, engineers at Solarflare’s Cambridge operation (formerly Level 5 Networks) opted for the XJTAG system. “XJTAG is the only boundary scan product that exploits the full capability of the JTAG chain to improve the speed and accuracy of fault diagnosis, achieve high test coverage, and migrate through design to production and beyond”, explains Derek Roberts, VP Hardware Architecture, Solarflare Communications. Stressing the portability advantages of XJTAG, he explains that Solarflare’s manufacturing services partner is also using XJTAG to test production boards. XJTAG combines boundary scan description language (BSDL) files for JTAG-compliant devices with the board netlist. Test scripts are written in a high-level language and support a device-centric approach to JTAG testing. This allows tests written for XJTAG to be re-used throughout the product lifecycle, from development and prototyping to full production. From the beginning of the EF1-21022T project, XJTAG accelerated troubleshooting of development boards, allowing engineers to get new boards up and running in a matter of hours. Troubleshooting complex boards is notoriously time consuming, and usually takes days or even weeks when using traditional techniques such as “buzzing out” the board. For production testing, Solarflare engineers have created an automated production test jig based on XJTAG, which has saved the complex design challenges, high production costs, long lead-times and high maintenance overheads that characterise traditional in circuit test fixtures. Board changes can also be accommodated by writing new test code, instead of reworking or redesigning a fixture. The XJTAG based test jig also achieves a very short test time per board of around three minutes. Historically, this cycle has required around 15 minutes using conventional test techniques. XJTAG also supports programming of devices such as flash memories, EPROMs, FPGAs and PLDs, via the JTAG chain, and Solarflare has taken advantage of this flexibility to drastically reduce flash programming time – in one case from 4 hours to 8 minutes. Going forward, XJTAG’s component-centric test model will also allow Solarflare to reduce test development time for other products using the same components. “We can easily re-use test cases across multiple designs. This will save a great deal of time when developing and building future products”, confirms Derek Roberts. Solarflare Communications is headquartered in Irvine, California and has development centres in Cambridge, England and Sunnyvale, California. Solarflare and EtherFabric are trademarks of Solarflare Communications, Inc. 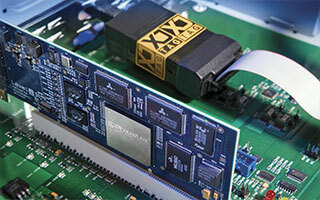 The XJTAG system is a flexible and cost-effective boundary scan solution that has transformed our test regime and delivered quantifiable benefits throughout the product lifecycle. We have been able to consistently get development boards up and running in hours as opposed to days or weeks, and we are making steady improvements to our production line test times – the test time per board has been cut from 15 minutes down to around 3. In addition, the XJTAG system has helped reduce our overall product development timetable and has improved production yield, which is good news for our customers. Solarflare Communications, a fabless semiconductor company, provides easy-to-use, standards-based, high-performance Ethernet solutions. Major end-users include banks, financial institutions, government bodies and utilities, for which high-performance networking and product reliability are paramount.